LVP Conveyor Systems Ltd. have assembled a range of products to offer a wide selection and choice in style and variation for the palletising market. With our experience, we know that not every application suits or warrants either a robot or traditional layer palletiser. We are also aware that you as a customer, may have a preferred machine type, and therefore, we at LVP Conveyor Systems Ltd. will work with you to find the optimum solution to your needs. The A700 robotic palletizer offers you maximum dependability in a minimal space. Completely automate your product loading and unloading. Lift the burden from your valuable employees. Eliminate the repetitive motion and back injuries that come with manual palletizing. Switch to a robotic palletizer like the A700 and discover the solution you’ve been looking for. 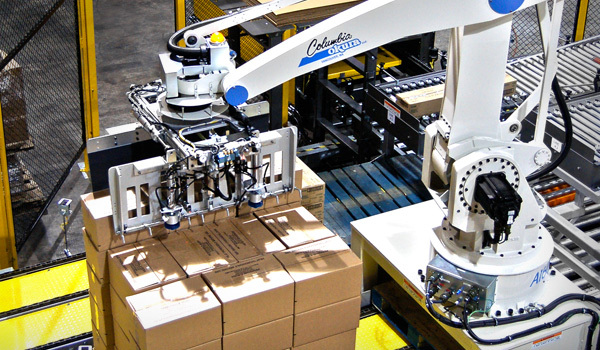 Our easy-to-use A1600 robotic palletizer makes quick work of individual or multiple packages. This high-speed heavy-duty tool is surprisingly simple to handle, thanks to a highly intuitive user interface. The A1600 also integrates seamlessly into any existing system configuration. When you want to make the most of your space and cut back on production time and labor costs, there’s no better choice than the A1600. You’ll notice a difference from the very first day. Once you’ve used it, you’ll wonder how you lived without it. Choose the A1800 high-speed robotic palletizer when you need an impressive palletizing and depalletizing solution. This tough new robot completes 1800 cycles per hour and stacks more than 28 bags per minute, with a payload capacity up to 310 pounds and a range of 360 degrees. The touch-screen interface offers user-pattern programming and easy operation. Space- and energy-efficient, its simple design promises a low-maintenance solution: increased uptime and high reliability. The new A1800 leads the pack, showing off speed and flexibility to easily meet your end-of-line requirements. This impressive model is just one in our fleet of tough palletizers. Are your needs changing? Our robotic systems can change with you, easily and efficiently. Choose the Columbia/Okura W models of high speed robotic palletizers when you need an impressive high capacity palletizing and depalletizing solution. These tough robots fit into the same operating envelop as our standard models but have a payload capacity of over 770 pounds. The touch-screen interface offers user-pattern programming and easy operation. Space- and energy-efficient, their simple design promises a low-maintenance solution: increased uptime and high reliability. The W-line machines lift heavier loads than any other with speed and flexibility to easily meet your end-of-line requirements. These impressive models are just a few in our fleet of tough palletizers. Are your needs changing? Our robotic systems can change with you, easily and efficiently. You need a versatile robot that can easily adjust to handle any product. That’s why Columbia / Okura has designed our wide range of standard end effectors to manage virtually any product: cases, bags, trays, totes, bales, bundles, crates, pails, pallets or sheets. These tools fit neatly with all of our robots. Service parts are available to provide immediate support on each of these standard designs, direct from our warehouse. Our robots come standard-equipped with highly advanced robotic palletising software to provide precise control of the robot’s every movement. Complete with detailed graphics and easy navigation tools, the software provides quick access to the 50 standard product patterns we’ve already built into the program. Plus, we’ve designed our “Do-it-Yourself” palletising software to make it simple and easy to add new patterns to your robot. Just create a pattern on your personal computer or laptop and download it to the robot controller. With the operator interface, patterns can even be modified right at the control panel. No need to interrupt your production schedule: create new custom patterns while your robot is running. We give you more than just industry-defining robotic palletisers. We give you peace of mind. Each of our state-of-the-art robots comes with complete systems integration services to ensure that your new palletiser works perfectly with your upstream and downstream equipment. These services include everything from concept and design to the integration and installation of your robotic palletising system.